Radio frequency identification (RFID) system has been successfully applied to the areas of manufacturing, supply chain, agriculture, transportation, healthcare, and services. 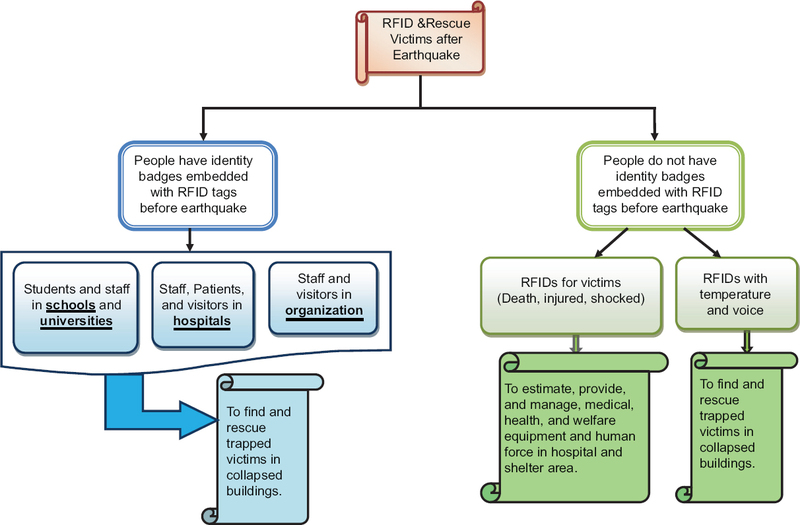 The RFID is already used to track and trace the victims in a disaster situation. Data can be collected in real time and be immediately available to emergency personnel and saves time by the RFID. The aim of this study was to express the role of the RFID technology in an earthquake to rescue victims. This study was a unsystematic review which the literature search was conducted with the help of libraries, books, conference proceedings, databases, and also search engines available at Google, Google Scholar. We employed the following keywords and their combinations; RFID, the victim, disaster, rescue, and earthquake in the searching areas of titles, keywords, abstracts, and full texts. This article presents two aspects of usage RFID; advantages and barriers. More than 60 articles were assessed, and 39 of them selected based on their relevancy. This literature review helps define the concept of “Tracking victims via RFID” (in terms of both advantages and barriers) as the new technology in the present age. The goal of social marketing is to change social behaviors in order to benefit the target audience and society as a whole have various applications in health care system. Social marketing sometimes uses behavior change methods in order to achieve its goals. Therefore, this study aims to identify behavior change methods in social marketing used for countering induced demand in health care system. This study was carried out using survey method and by searching relevant keywords in scientific texts, dissertations and Persian and English websites. The most important sources of information in this study included Irandoc, SID, Noormags, Springer, Science direct, and Emerald websites. The keywords used in searches were “Social marketing,” “Induced demand,” and “Theories of behavior.” The useful articles were selected after reading the abstracts and full text of the articles. In order to change the attitude of target audience about induced demand, theory of planned behavior change, BASNEF model, and the health belief of procede – proceed were investigated and the effect of each of their factors on behavior change and induced demand was determined. 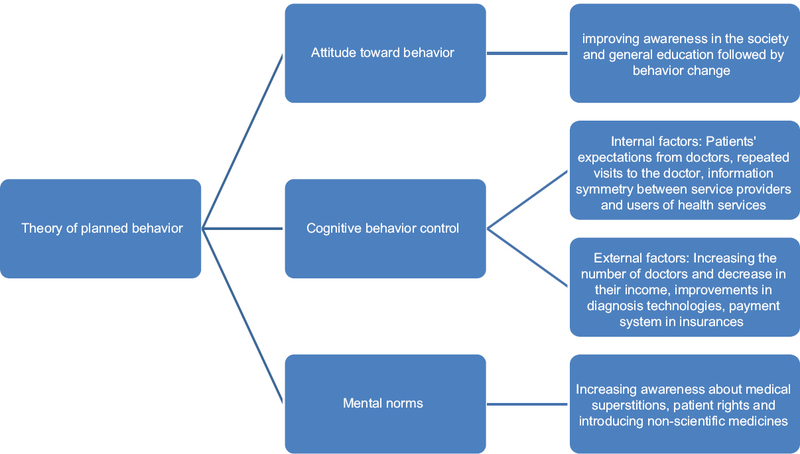 Among these factors, the attitude was determined to be the most important factor in behavior change. Based on the findings of this study, using social marketing models especially precede – proceed model can be useful for reducing induced demand. Disaster is defined as what creates an imbalance in the normal and routine course of human lives. Therefore, disaster management is an applied science that uses analysis of previous disasters and recent scientific and technological advancements to find solutions for prevention or counter the effects of disasters. In this regard, mass media can increase the awareness of society about disasters and increase the society's involvement in disaster (SID) management, taking an effective step in reducing the adverse effects of disasters, and in time help prevent future ones. The aim of this study is to investigate the role of mass media and their effectiveness in disaster management especially in improving public involvement in disaster management. This study uses simple review method by searching for relevant information incredible scientific websites, scientific texts, and scientific articles. In this regard databases such as Magiran, Google Scholar, and Science Direct SID were investigated between years 2001 and 2014. The results of these searches revealed that several studies investigate the different viewpoints about the role of media in disaster management with the consensus being that mass media can be an effective tool for dealing with disasters and disastrous situations. In most studies, the conclusion is that without the help of national and mass media, it is impossible to achieve an effective disaster management. Finally, we concluded that media can play an important role in all stages of a disaster from before the disaster to after a disaster and rebuilding efforts. Mass media can improve the public's awareness and educate the people and also improve the SID management. Background: This paper explores the various challenges that the health sector faces as corruption creeps into the sector. Objective: The research explains various review methods used to identify corruption and delineates anticorruption strategies appropriate to the health sector. Conclusion: The article concludes with suggestions for applied research needed to extend our understanding of corruption, and to help policymakers craft effective interventions. Given the fact that corruption is a chain reaction that traps millions in poverty and misery we have the social responsibility to take a stand on ethical practice. Further, the paper is a call to revise the Hippocratic Oath so as to include a clause against corruption in medical practice so that the saved individual, thanks to the treatment received, might not, along with the family, and be dragged into poverty which is just as life-threatening. Objectives: Polluted biomass fuel important contributor for low birth weight (LBW). Exposure to biomass fuel during pregnancy lead to LBW, the objective of this study was to determine the association of exposure to biomass fuel and LBW. Methods: In total, 10,023 ever married women were interviewed reported 41,094 births for last 5 years from Pakistan Demographic Health Survey 2006–07. Logistic regression models were used to assess the association between biomass exposure and birth weight after adjusting for demographic, maternal, and child characteristics. Odds ratios (ORs), 95% confidence interval (CI) and P value were calculated. Results: The proportion of LBW was 35.4% (n = 1777) in common high polluted biomass fuel (wood), 36.3% (n = 282) in less common high polluted biomass fuel (electricity, cylinder gas, and biogas) and 29.5% (n = 805) in common low polluted biomass fuel (natural gas). Infants born to common high polluted biomass fuel (wood) users were 28% more likely to have LBW (OR: 1.28, 95% CI: 1.02–1.61, P = 0.03) compared with infants born to common low polluted biomass fuel (natural gas) users while significant positive association of less common high polluted biomass fuel with LBW (OR: 1.41, 95% CI: 1.07–1.84, P value 0.01) after adjusting for potential confounders. Conclusion: Biomass fuel exposure during pregnancy was significantly associated with LBW of child. There is need for reduce the exposure of polluted biomass fuel and replace with low biomass fuel to reduced burden of LBW. Context: In critical situations, the health system is the most vital institute for responding to the injured. Aims: In this study, hazards threatening Health Care Centers of South Tehran and their level of preparedness for encountering critical situations have been considered. Subjects and Methods: The present study is a descriptive cross-sectional study conducted in 2013 in 28 Health Care Centers of South Tehran. Required data were collected using a ministerial checklist composed of 47 hazards and 34 areas of preparedness, and were analyzed using SPSS v. 20 software. Results: The average level of hazards has been estimated as 0.98 ± 0.077, and the highest and the lowest level pertain to air pollution (2.61) and volcano (0.11), respectively. Minimum and maximum frequencies of hazards were 12 and 47, respectively, and totally the average preparedness was obtained at a medium level as 1.57 ± 0.287. The highest preparedness score was for firefighting (2.17), the lowest one was for insurance coverage (1.05), and financial affairs (1.16). The level of preparedness for security is at a medium level (1.63). There was a significant relationship between diversity and the level of risks in communication centers (P < 0.05, r = 0.408). Conclusion: Health care centers encounter different and sometimes serious hazards. Therefore, considering the preparedness score of health care centers (at medium level), these organizations need to review and improve their crisis management programs and actions. They should also enhance the status of centers regarding their support, operations, and finance. Introduction: In the aftermath of occurring events or crises, the outbreak of many unfavorable disorders is common and inevitable in society. This study deals with the analysis of the long-term effects of the crisis of quake on children's mental health. Methodology: It is a descriptive study and it simple random sampling procedure. The device of data collection is a standardized questionnaire of the Impact of Event Scale-Revised (IES-R).The samples are selected by referring to the girls'- and boys' high school between the ages of 14 and 18 in Bam city, and the choice of samples volume among the students are selected on the proviso that they give affirmative answer to the three questions in the form, which include: (1) Residing in Bam city in the period of quake, (2) having experience of quake, and (3) having the ages of 5–7 at that time. Results: The findings of this study showed that the most prevalent susceptible experience is related to those who confronting with losing one of their relatives (n = 188, 79/7%), and also the findings of the study in relation to the frequency of posttraumatic stress disorder (PTSD), 95 of participants had a higher score of IES-R, can be recognized as the “PTSD probable cases.” Conclusion: The findings indicate that mental health problems and traumatic for a long period of time remains. Proper planning authorities must take in order to protect vulnerable groups. Introduction: Natural disasters have the potential to affect psychological health. In June 2013, a multi-day cloudburst caused devastating floods and landslides in the North Indian state of Uttarakhand. Objective: This study aimed to assess the prevalence of posttraumatic stress disorder (PTSD) symptoms in the population of Uttarkashi, Tehri, and Pauri Garhwal 1-year after the cloudburst and flash flood - June 2013. Materials and Methods: PTSD checklist, civilian version (PCL-C) and Diagnostic and Statistical Manual of Mental Disorders Fourth Edition Text Revision (DSM-IV TR) were used as a screening tool. This cross-sectional study after 1-year of the disaster conducted in three districts of Uttarakhand between July and October 2014. Frequencies, percentage, and Chi-square methods were used to calculate the results. Results: Each case adopted for the study was similar on its basic profile. Participants included in the study fell in the symptoms severity range of 5–2 scores of PCL-C. On a match with both criteria - DSM-IV TR criterion and cut-off point of PCL-C Scoring prevalence of PTSD symptoms was found 70.93% in Tehri, Uttarkashi, and Pauri (n = 1651 with average age of 41 years). A higher prevalence has been noted in female population (Tehri 55.85%, Uttarkashi 55.66%, and Pauri 63.68%) in comparison to male population (Tehri 44.15%, Uttarkashi 44.34%, and Pauri 36.32%). 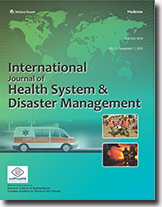 Conclusion: (1) PTSD in disaster victims is as prevalent and persistent in Tehri, Uttarkashi, and Pauri districts of Uttrakhand state in India as elsewhere, (2) the risk of developing PTSD in subjects with lower initial exposure to disaster trauma should not be ignored, (3) remarkably fewer diagnoses of PTSD were made by using both DSM-IV -TR criteria and PCL-C, and (4) Female stress response for natural disaster trauma is comparatively higher than males. Introduction: Social capital is faced with some challenges including addiction which has a fundamental effect on the strength and mechanism of social capital. A proper understanding of the harms, analysis of their process and provision of the necessary practical prescription and their operationalization are essential and efficient ways to control and curb the harms to society. 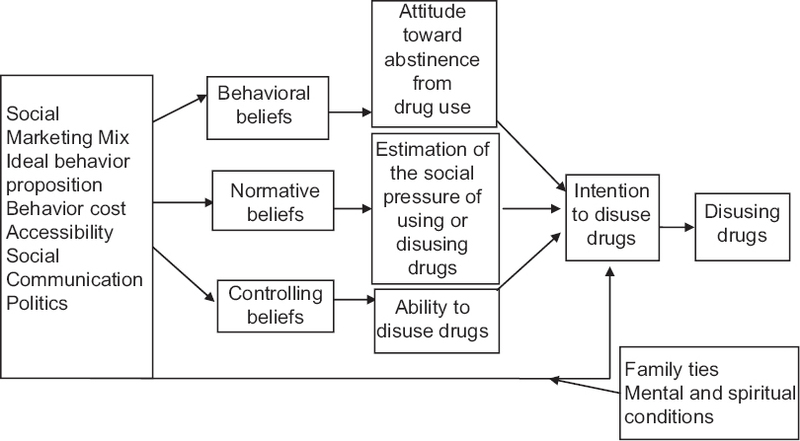 This research has examined the mixed social marketing effect on the youths' intention to avoid drug consumption. Taking the related literature and background of the research into consideration, twelve hypotheses have been put forward and tested. Method: The under study population were comprised of male secondary school students of Isfahan province who were 68,035 students on the whole. A random selection process had been applied to choose the participants. As different districts of Isfahan province had been chosen to gather data, two schools were chosen randomly in each district (distinct in cultural and social position), a questionnaire was given to their counselors, and some of the students who were volunteer to take part in the study were selected. Morgan sampling table was used to determine the sample size, which determined 381 people as the appropriate sample size. In order to gather data, the questionnaire designed by the researcher was used whose validity and reliability were approved by the professors of the field and Cronbach's Coefficient Alpha which was more than 0.75 respectively. Amos 20 and SPSS 18 software were used to analyze the data. Finding: The results indicated that social marketing mix has a positive and meaningful effect on the youths' intention to avoid drug use with a regression coefficient of 0.81.